After angioplasty, physicians almost always insert devices called stents to keep the blood vessels open. A tiny, slender, expandable metal-mesh tube, a stent fits inside an artery and acts as scaffolding to prevent the artery from collapsing or being closed by plaque again. 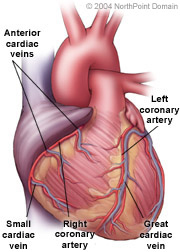 After angioplasty is complete, a stent may be placed inside the artery. To place a stent, the physician removes the angioplasty balloon catheter and inserts a new catheter on which a closed stent surrounds a deflated balloon. The stent-carrying catheter is advanced through the artery to the site of the blockage. The balloon is inflated, expanding the stent. The balloon is then deflated and the catheter withdrawn, leaving the stent in place permanently.